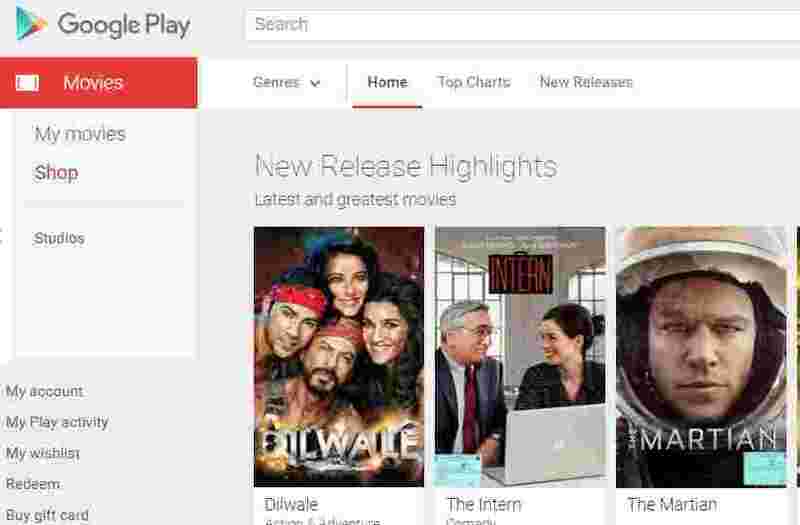 Netflix Alternatives, Movie Streaming sites : – Whenever you want to stream film, perhaps Netflix is the first answer that you hear from the rest of the 69 million dedicated subscribers. Watching movies and TV shows on that smart TV have been never been so fun till we knew Netflix. They are known to provide the best of DVD rentals by mail and have even surpassed the popularity of the likes of Walmart and Blockbuster eventually. So for the west that includes entire North and South America, parts of Europe, and other countries like, Australia, New Zealand Japan, Netflix is the top streaming services from Hollywood. However, as even the best has its weaker sides, you may find the Netflix streaming content of mediocre quality and not at par with DVD or the Blu-ray disc quality. Nevertheless, from the frequent changes, intermittent outages to the $7.99 subscription fee or the fact that you are simply bored of the usual stuff, there can be many reasons why you want an alternative to Netflix. While there are many great paid alternatives to Netflix, there are several free alternatives as well which can keep you entertained. Today we have listed some of the top paid and free alternatives to Netflix / free movie streaming sites from where you can select the one according to your budget and preference or you can stream movie for free selecting from the free sites . So find out your favorite among the list. Check out these sites like netflix which are way better than netflix. If you want to savor your Popcorn over some time pass entertainment just for those lazy days, Popcorn Flix offers just the right mix to you, on which you can watch movies online for free. From some cheesy movies like, “Don’t Look into the Cellar” to some pretty decent indie film, comedy and science fictions along with a dash of Hollywood movies makes it a decent alternative to Netflix. Compatibility: Web, Android, iOS, Amazon apps, Blackberry, Roku, Smart TVs and XBOX. On days when nothing goes right simply hit The Internet Archive and you should not be disappointed. It hides some of the best classic flicks beneath like, “Charlie Shanghaied” or the “Phantom of the Opera” so you really need to dig into the website to get what you want. The Internet Archive site is a collection of millions of classic movies which you can watch online for free. Looking for something different for entertainment this time? Viewster can be one of the sources for some unusual content that differentiates it from the other streaming services. From the incredible “Korean Drama” to the genre of “Critical Darlings” they have a good collection of movies, channels, series and animations. Retrovision is another source for those classic Hollywood flicks and shows that includes animations as well. From comedy, drama, horror, to the genres of crime, sci-fic, war and more it has a wide range of vintage videos to keep you hooked in. Treat yourself with some real good movies like, “Santa Clause Conquers the Martians” to the ones like, “Bottle Rocket”. We can bet that nothing can be more fun than watching such movies for free with some popcorn along. Wow! Now, that’s a cool collection on Veoh considering that it does not cost you a dime to treat yourself over nachos. Veoh features a maddening collection of movies, music and channels, especially movies in any language ever made and you can stream movies for free at this portal, so you really need to be all set before you dig in to that movie dictionary! Even though Vimeo may not have to offer you the best of movies, however it offers some decent collection On-Demand. You can also pick from the categories or from what the staff recommends to stream instantly. It functions similar to YouTube where you can also upload videos made by you. But the length of the videos and the quality is much better from earlier days and hence its an old source of good movie collection which you can stream completely free. Perhaps one of the best free alternatives to Netflix, Crackle (a Sony offering) offers some of the best collections from the old-times along with some great recent releases. We must praise the quality of TV shows as well that features the likes of “Seinfeld”, “Comedians” and more. Moreover, you also have the original shows to rely on such as, the “Chosen” or the “The Art of More”. Compatibility: Apple TV, Android, iPad, Amazon Fire TV, Windows, PlayStations, XBOX, Roku, Smart TVs and more. Only if you are an alien who just landed on the human zone, you would not know YouTube. So while you can enjoy some great stuff on this hugely popular platform for free, you can also watch full-length movies from anywhere on this earth. From big names to the anonymous you have them all for your entertainment. Compatibility: Android, iOS, Web, Apple TV, XBOX, PS3, Kindle Fire, Nook. Funded partly by some of the biggest names like, MGM, Paramount Pictures and Lions Gate, Tubi TV is your ultimate source of free entertainment and undoubtedly a great alternative to NetFlix. It allows you to stream from over 40,000 films and TV shows for free while it works with most of the devices. 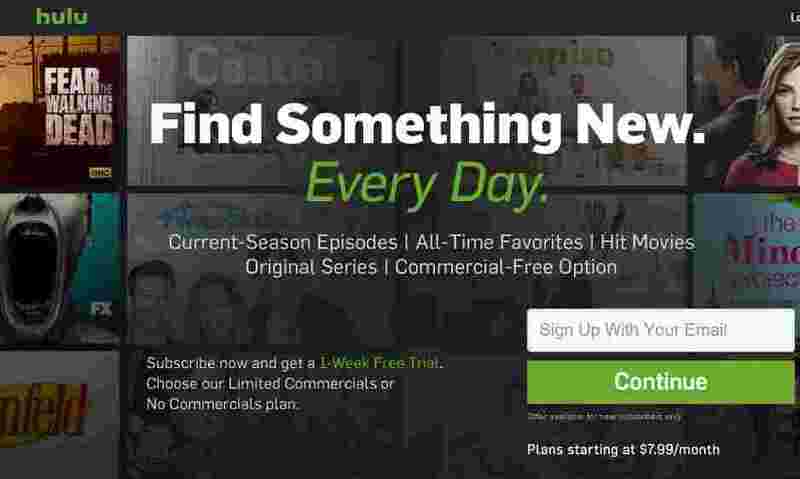 It offers a menu quite similar to NetFlix and Hulu and gets you the best from all categories. SnagFilms is a great alternative to Netflix for those who want a free lunch. One of the well-organized website with some cool collections that have been well cared for, SnagFilms impresses many with its free list of movies and TV shows, and its stylish layout. If you are the one who finds pleasure in the old world Hollywood classics, Classic Cinema Online is one of the best alternatives to Netflix. From the vintage serials like Captain America to the classics like, Anything Goes you get a decent collection of movies and shows in there. Epix allows you to access its on-demand video service on their website if you subscribe to their cable channel. It is basically a hybrid premium cable channel same as HBO or Showtime and streams movies via partners like MGM, ViaCom and Lions Gate. The only flip side is that it does not let you stream content from the site despite having a device unless you subscribe to the pro version of the cable service. Well, Yidio is more of an online hub that collects movies from all sorts of streaming sources like, Netflix, Crackle, Amazon and more. So, while it saves your time in hunting the right video streaming services among the clutter, it also gives you the option to select the streaming service of your choice. However, you do have to subscribe for some of the services that you choose. The free videos and many films from free sources add to its flavor. If you really like torrent files, you can surely help yourself with public domain torrents. T’s pretty clear from the simple site that you can download movies for free, however you have choice to buy them also. 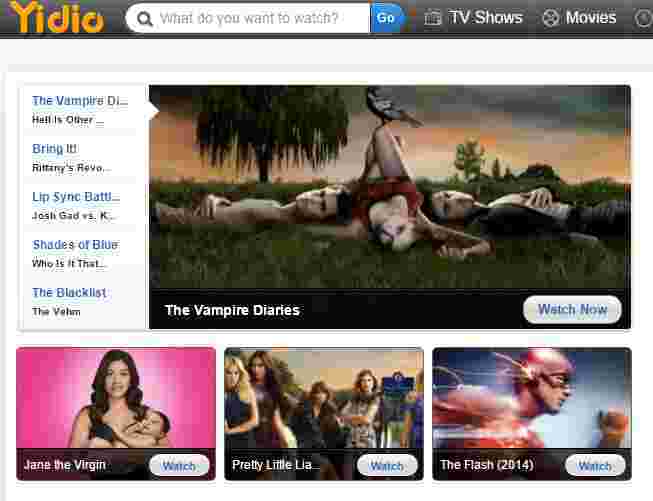 One of the basic websites we have seen in this category, it also offers live TV shows along with movies from all genre. 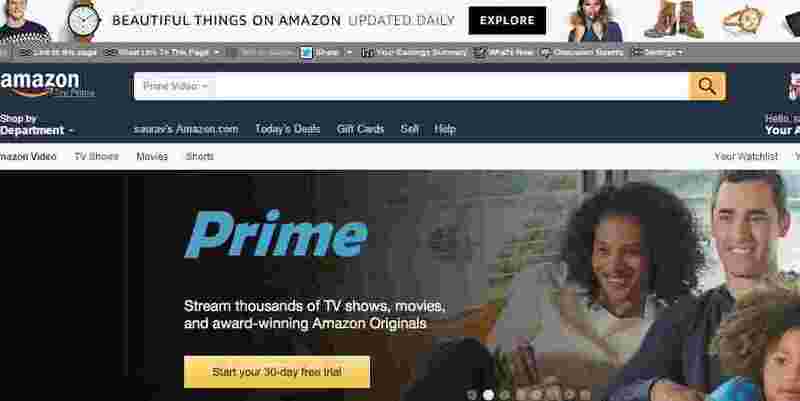 Coming from the biggest online retailers across the globe, Amazon Prime/Instant Video offers two different services in this category. While you can either buy or rent instant video serving your immediate entertainment needs, you can also stream unlimited movies and TV shows if you are subscribed to the Amazon Prime version. 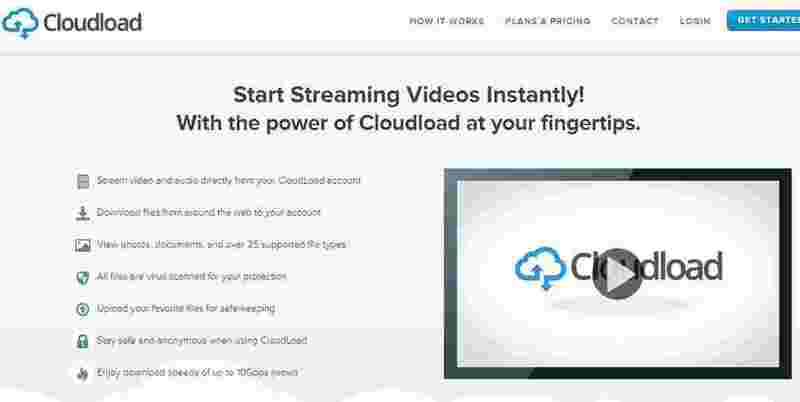 This cloud-based streaming service not just allows you to stream films and TV shows from its largest collection, but you can also have some added fun by listening to music and see documents on your mobile phones, computers or even on television sets at an extremely reasonable price with no commercial interruptions. A partnership venture by some of the top TV networks like ABC, NBC and Fox, Hulu is a good alternative to Netflix considering that it is available on almost on all devices and offers high-quality content. Apart from being able to watch some great shows, it also entertains you with international content and some other cool cable channels like, Syfy, FX, Comedy Central and more. Compatibility: PlayStation, Smat TVs, Kindle Fire, iPAD, Roku, Blu-Ray players, Web, Nook, iPhone and more. This iOS store and player which is also the largest music store in the world, has been sourcing HD films and TV shows (next day) since long. 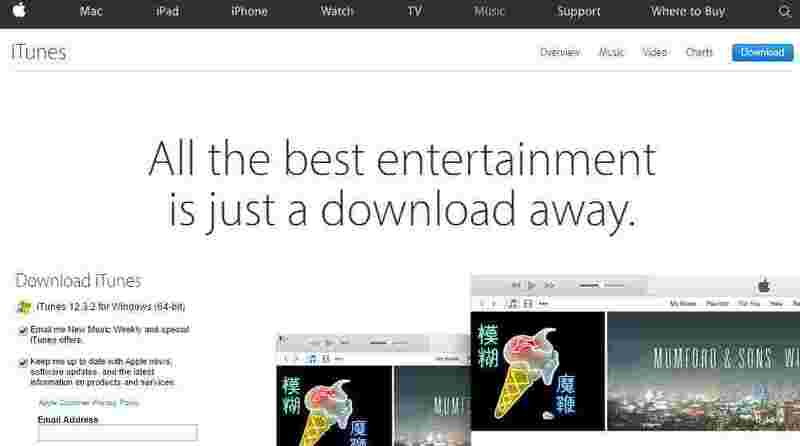 However, unlike others iTunes it does not let you stream or subscribe, but you need to rather buy directly. Priced on the higher end you have a comprehensive catalog to choose from. Watch high-definition movies and new TV shows on a wide range of devices and stream films on the day they are out on the DVD with Vudu, some of which are also in 3D. Experience a quality close to Blue-Ray with HDX visuals and surround sound format. 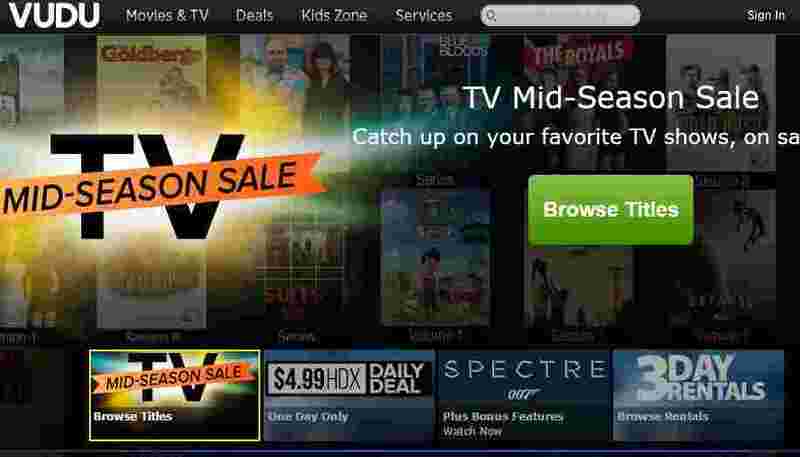 Whats’ more, as you can also store or playback Ultraviolet videos with Vudu! Price: Rent a movie starting at $0.99; buy at a starting range of $4.99. Buy TV shows at $2.99 for HD/HDX; $1.99 for SD; Complete season from $16.99. Compatibility: PlayStation, Blu-Ray Web, Android, Roku, Smart TVs, iPad. Apart from being a good alternative to Netflix, it is also an alternative to those who are dedicated to Android/Google-based platform than iOS. The only demand here is to download a player in order to play the rented/purchased movies or TV shows and the rest is smooth. Yes, but what you see totally depends on the deal. Currently owned by BestBuy, Cinema Now offers a decent collection of movies and TV shows like all seasons of “The Sopranos” or “The Enlightened Girls” from HBO along with some of the up-to-date great TV shows from FX and AMC. Compatibility: Blu-Ray, PlayStation, HD TVs, Web, OS and Android Devices. Blockbuster On Demand is a reasonable alternative to Netflix considering that you only for what you rent, however, it’s only for movies and there’s no streaming service for TV shows as of now. Bonus lies in the HD quality video (1080p), full 5.1 surround sound which is a notch above the Netflix, and no subscription fees. Compatibility: Blu-Ray, Samsung TV, Android phones, Web and home theatres. Stan is considered to be one of the biggest contenders of Netflix in Australia with its selection of content providers and a wide range of exclusive shows that include “Better Call Soul” and “Breaking Bad”. That’s not all, as you also get access to its own productions in competition to the other streaming services and some even from Amazon. Compatibility: Smartphones, Tablets, Smart TVs, Web, Apple TV, Telstra TV, via Chromecast, iOS platforms and Android Platforms. If you are from US, Canada or the North America and a sucker for British TV shows, Acorn.TV is just the one for you. While you do not miss on your favorite shows like, “Queer as Folk” or “Holy Flying Circus”, you also get the bonus in terms of additional features, exclusive trailers and more. With Fandor you have options galore for award winning international and indie films. From famous indie movies like “Blind” or classics like “Dark Star” to the cult documentaries like “5 Broken Cameras” they have it all. At a reasonable price, it offers some enviable collections difficult to find with other streaming services. Compatibility: iOS, Android, Kindle, Roku, Chromecast, Apple TV. 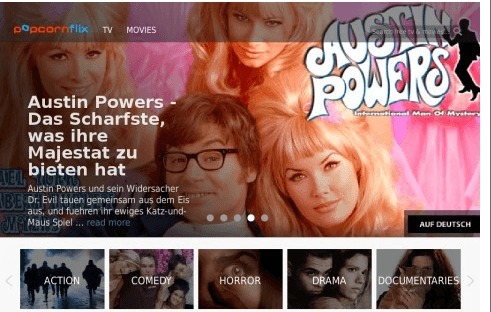 M-Go is a pretty new streaming service in the category which seems to grow quickly with its collection of movies and TV shows. The well-organized website lets you find your preferences smoothly and assists you with some cool suggestions. Even though it lacks the unlimited streaming option, but the facility to buy films and shows along with reward points in return makes it a viable alternative to Netflix. No Subscription fees. From Korean and Taiwanese Drama, Global TV shows, or Hollywood to music and movies across the world, Viki has to offer you some real niche content. Apart from focusing on Asian content and curating entertainment from all over the world, it also invites communities to add subtitles on their website in over 150 languages with a creative common license. Price: Free, $3.99/€3.59/£2.49 per month. If you have a local public library card, you can check on Hoopla if it is hooked on it to instantly stream content from the library. From eBooks, Movies, Comivs, Audio Book, Music to even the most popular TV shows Hoopla has it all for the curious entertainment buffs like us. You can call it a Netflix for libraries and is a cloud-based digital media. It serves only the US for now across 256 libraries. Compatibility: iOS6, iOS7, iPad 2, iPad Air, iPad Mini, iPhone, Android, Web. myLifetime pairs up with your TV service providers like Lifetime, Planet H, History and others to serve you a bunch of movies, shows or videos. You can stream full movies online which are thankfully free of commercials. While they add a new movie to the list every day, the price also does not pinch your pocket considering the stuff you get. While Netflix streams videos for you in the US, the biggest setback is that it does not show anything live and there doesn’t seem to be any plan soon either. So for those who prefer watching fresh off the shelves stuff, Sling TV by Dish Network is a smart option for them. For a monthly subscription you have access to live streaming of some of the top channles like, Food Network, CNN and many more. You can choose to pay more for more channels. What can be better than this when you get premium services for no cost? 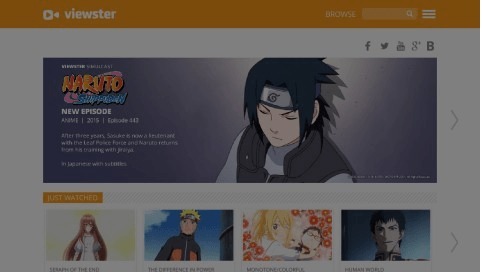 If you are fan of Anime and Manga then this streaming serving is just the right choice for you. The fact that it is available on a wide range of devices with free access to equally wide range of content (with few limitations though), makes it an instant hit. While you can view the standard quality in the free version, an upgrade allows you to watch your fav pick in premium quality. Did you know that your favorite Playstation device can double up into a full-time alternative to Netflix? So, if you have those from the Sony Bravia HDTV, Xperia Smartphone, Sony Tablet or any of the gaming consoles, you can simply convert your boring evenings to the fun by streaming movies and shows through them either rented or purchased. Head over heels with cartoons? Pub-D-Hub can serve just the right purpose with those classic animated movies like, “Cat and Betty Poop” along with some good collection of movies, TV shows and yes, also radio. You simply need to remember to install the Flash before you enjoy your favorite stuff. TORREMO is another best movie site for movie lovers. 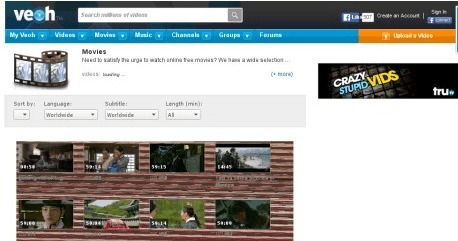 Users can search movies by names, casts and directors. You can also search movie by genres like action, adventure, animation, biography, comedy, crime etc. All movies are in good quality and you can download your movies by single click. You will get two options for movie download first one is magnet download and the second one is torrent download. The choice is all yours. And the best thing is here all services are free. Ultraflix is a good one to. I just love using Viewster! It’s awesome. This is definitely the nicest and most comprehensive list i’ve seen so far but i prefer movieboxd.com interface a lot better.